This is a great spread! I tasted something similar at a gourmet grocery store. I decided to experiment to recreate it. The below is very close and very easy. The key is taking the extra time to “roast” the garlic on the stove top over med-low. Do not go higher or you will end up frying or burning the garlic/artichokes and lose the flavor of the olive oil. In saute pan over med-low heat, pour in 2TBS of olive oil, put in artichoke hearts (cut side down), pepper and garlic. Cover and roast for 15 – 20 minutes until garlic is soft but still its natural color and a slight give if cutting through it (you don’t want to brown it.. but if you do, no biggie, the flavor will be a little sweeter). Stir occasionally. Remove the lid the last 5 minutes of cooking. This will allow some of the liquid to steam off so you don’t have a runny dip. Put all in a blender or food processor. Process until smooth. Add a pinch of salt, and 1 TBS of olive oil. Process again. Taste. if needed, add a pinch of salt at a time, and/or more olive oil (1/2 TBS at a time) for a smooth consistency. Spread on bread, crispy pita, crackers, with baked potatoes, with roasted or fresh veggies..
Best served warm or room temperature. Tip: Cooking the garlic this way will take the bite out of the garlic and keep the spread nice and smooth. 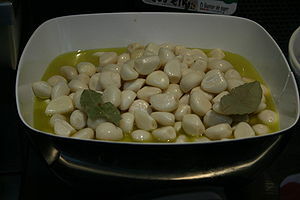 You can also cook garlic on the stop top in a little olive oil and keep it in the fridge for up to a week. This will give you quick garlic additions to dinners, sauces, with a milder garlic flavor and without the strong garlic breath. For a twist, you could add greek or kalamata olives (or mix), but I would not add more than 1/4 cup whole pitted olives and add them to the pan. Posted by culinaryease on December 3, 2010 in Parties, Appetizers, and More, Recipes, Vegan/Vegetarian and tagged Artichoke, Garlic, Olive oil, Spread.